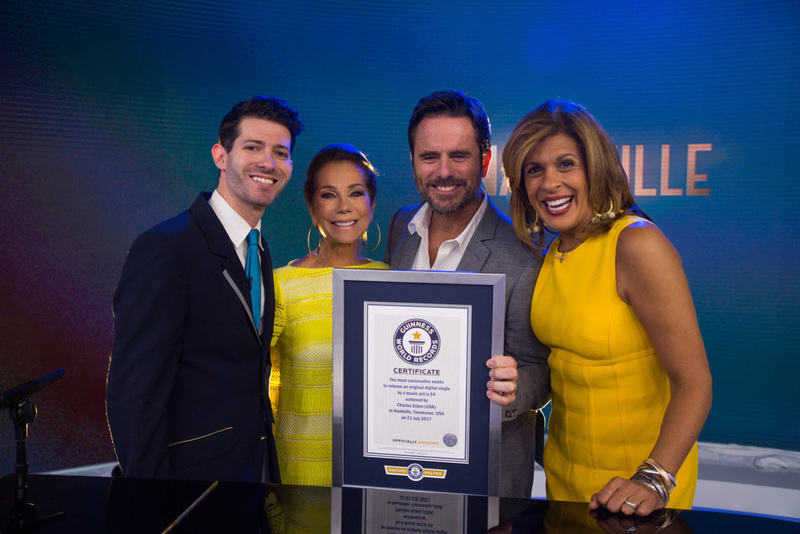 Following his performance of “Halfway Home” this morning on NBC’s TODAY, Charles Esten was presented a certificate for the GUINNESS WORLD RECORDS title for the Most consecutive weeks to release an original digital single by a music act. The GUINNESS WORLD RECORDS title reflects his #EverySingleFriday campaign which started July 15, 2016 and ended on July 21, 2017. The campaign yielded 54 original songs that Charles wrote (or co-wrote), recorded, and released every single Friday since the campaign began. “Halfway Home” — the song he performed this morning on NBC’s TODAY — was #29 of the 54 songs in his #EverySingleFriday series. All songs are available at iTunes, Spotify and Pandora and on physical CD via CharlesEsten.com. This GUINNESS WORLD RECORDS title comes on the heels of Charles’ 100th performance on the Grand Ole Opry last Friday night, July 20. Tonight he performs at New York City’s “City Winery,” and tomorrow he plays "City Winery” in Boston. Both shows are SOLD OUT. His Boston concert takes place at approximately the same time as the airing of the CMT series finale of “Nashville” (8pm/ET). In honor of the occasion, Charles plans to pause his concert, tune in to CMT and watch the final season’s final episode, with friends and fans.